The colossal image of savior Parshwanatha shown in this picture is belonged to Boodhi Chanderi group of Jain temples, Near Chanderi, MP. Boodhi chanderi is situated about 20 kms from Chanderi town in north-west direction. The town was once a center of Jainism during medieval period and was on it's full glory during 10 to 13th century AD. This ancient town Boodhi chanderi is situated in dense forest spread over hilly terrain.Some ancient gates or doorways were erected in ancient time which is also visible in dilapidated condition.The place is situated on right of river Urr or Urvashi. The colossal image of Parshwanatha is situated in first temple of Boodhi chanderi group of Jain temples.Currently these temples are under protection of ASI and guarded by some guards during day and night time.In this group there are 5 temples in a premise where Jain relics and artefects are scattered everywhere.A shantinatha shrine is present here where head of lord Shantinatha is absent and image is in mutilated condition. 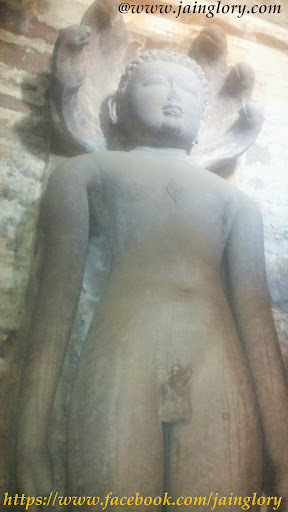 In 1967 about 2500 sculptures of Jain and Brahmnical sects were taken from this ancient site by Archaeology department.One complete gallery of Jain teerthankars is displayed in Chanderi govt. museum. It is said that there were about 55 Jain temples in Boodhi chanderi which are not present today but artefacts,lintels and sculptures are spread in forest of Boodhi Chanderi as well as preserved at Govt. museum of Chanderi.Some ancient Archaeological heritage is prone to risk of being smuggled. If we dig into history of this place then we finds that there was a large settlement of Gurjar Prathiharas. This was possibly capital of Gurjar Prathihara monarchs.Some Jain sculptures excavated from this ancient site contains inscription of 1159 and 1234.